Dr. Hoffman knew she wanted to be a veterinarian from a very young age. Although she didn’t have any pets of her own, she always enjoyed being on her grandparents farm and spending time learning about animals. When she was in high school, she participated in a job shadowing program where she was lucky enough to be paired up with Dr. Lynch, who immediately became a mentor. The shadowing experience led to her first veterinary job, working in the kennel at the Moriches Hospital for Animals. She earned her B.S. in Animal Science at Cornell University, after which she earned her D.V.M. at Western University of Health Sciences College of Veterinary Medicine in Pomona, California. After a few years of practicing at an eastern Long Island small practice, Dr. Hoffman came back home to the Moriches Hospital for Animals. Dr. Hoffman loves knowing that each and every day she goes to work that there will be interesting surgeries to perform, diagnostics to evaluate, clients to educate, and patients to see improve with care. Each element is important as not every patient “follows the textbook.” It is important to treat every pet and their family independently to determine the appropriate course of action. 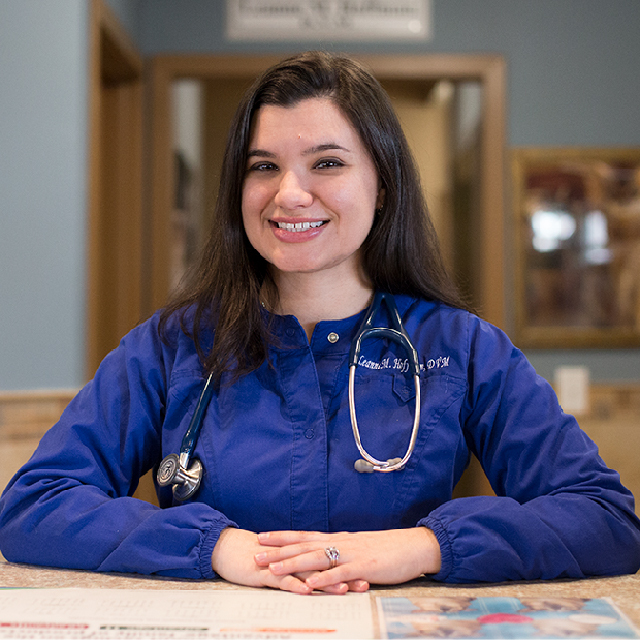 Although Dr. Hoffman likes to solve the puzzle of diagnosing and treating her patients and her ultimate goal is to hone wellness care and preventative medicine so your furry family members live longer, healthier lives. Dr. Hoffman is a member of the American Veterinary Medical Association, the New York Veterinary Medical Society, and the Long Island Veterinary Medical Association. She is also excited to now be a Medivet Accredited Adipose Stem Cell Practitioner. Dr. Hoffman and her husband, Michael, share their home with two cats, Phoenix and Fawkes. Dr. Hoffman fostered Phoenix and his litter mates, while attending veterinary school in California. Like a true California cat, he enjoys lounging in the sun and grooming himself. Fawkes is mischievous troublemaker with charismatic charm. When not working, Dr. Hoffman and her husband enjoy Paint and Sis, cooking, exploring Long Island, and working on making their new house a home.